﻿»Have we got the lot?« The King of Rock’n’Roll certainly didn't need to ask whether his entourage had collected together all their favourite hits. They had gathered them all together - a collection of "Golden Records", rather like a selection box of favourite chocolates, greedily swallowed down and enjoyed to the full. And how they loved them all - whether 'complete works' collectors or fans. To this very day, this collection from 1958 is quite set apart from the normal 'best of' collections. It shines out like a precious jewel among mere pebbles. This was the first of four Gold volumes, and it set the standard for those to come. Before any of the immemorable songs came to be included, they had to have sold at least a million copies and won an undeniable and unforgettable reputation as a heart-string plucker. To name a title is more than superfluous. It's quite enough just to listen and enjoy. 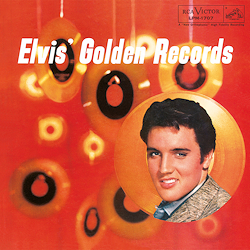 Whoever wants the ultimate basic Elvis collection can’t go wrong here.